Good morning, and welcome as we come together to celebrate the feast of St. Ignatius of Loyola, who founded the Society of Jesus, which most of us know as the Jesuit Order. I feel especially close to him, because many of my first teachers were Jesuits. You know, I’ve been thinking a lot about the modern Christian Church, and it seems to me one of the central problems we have today is that many of us view our faith like a drunkard views a street lamp. We use it for support, rather than illumination. It was not always so. 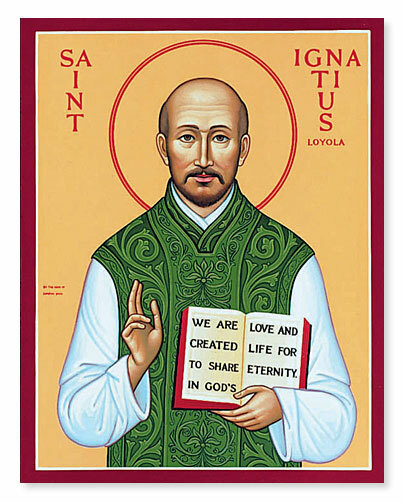 In fact, St. Ignatius of Loyola was one of the brightest lights in the history of Christianity. He was born in 1491, and in his former life he was a Spanish knight from a Basque noble family. When he was seriously wounded in battle around the age of 30, however, he underwent a significant religious conversion. Ignatius became a mystic, spending many hours a day in prayer and also working in a hospice. During that time, he had a remarkable spiritual experience. He had a vision in which he said that he learned more than he did in the rest of his life. This vision seems to have involved a direct encounter with God, so that all creation was seen in a new light and took on a new meaning and relevance, an experience that allowed Ignatius to find God in all things. This grace, finding God in all things, serves as one of the central characteristics of Jesuit spirituality. At the age of thirty-three, he began to study for the priesthood, although he was so poor at the time he found himself begging for food and shelter. He was also jailed by the Inquisition at this time. Around then, he and six companions made solemn vows to continue their lifelong work of following Christ. He founded what would become the Jesuit Order. While he was living as a hermit, Ignatius began to develop a set of exercises, designed to help believers discern the movement of the Spirit. One of the crucial notions in these exercises is the idea of “indifference,” of being indifferent to the concerns of the world—not in the sense of caring about people or things less, but in the sense of not letting our ego and our attachments get in the way of our relationship with God. As Christians, we are called to be indifferent to whether we’re well-known and influential or obscure, whether we’re rich or poor, or even healthy or sick. Our focus must be on whether God is present in our lives—and God is always present, is right there with us, closer than we are to ourselves. And I think that’s part of what Luke is trying to explain in today’s passage from the Gospel. It’s a harsh passage, a shocking thing: hearing Jesus tell a man to disregard the burial of his father, and it doesn’t give way to easy explanations. But sometimes we have to ignore a good thing to pursue a holy thing: our highest calling to follow God single-mindedly. I think Jesus is explaining that being a disciple sometimes requires us to make hard choices: to decide if we really do love the Lord our God with all our hearts, all our souls, and all our strength. In the kingdom of God, traditional loyalties are going to be rearranged. This entry was posted in Uncategorized and tagged Anglican, Bible, Disciple, Bible, Christianity, discipleship, Episcopalian, Jesus, Moral Theology, Scripture, Spirituality, St. Ignatius of Loyola, The Kingdom of God, Theology. Bookmark the permalink. It reads well, but was even better spoken! Good work, Brother – see you later. I’m glad you liked it, Sister. Thanks for this James. Very good work. You’re far too kind of but thank you. Beautifully written. I especially like: ‘…many of us view our faith like a drunkard views a street lamp. We use it for support, rather than illumination.’ Also, I now work for a Christian organisation that provides palliative care and had not known St Ignatius worked in a hospice. Thanks for your insights. Many thanks for your kind words. That’s good and holy work you’re doing there. Wishing you all the best. And now we have the first Jesuit Pope, and he seems to be changing the face of The Church for the better. Latest thing I saw a video of him visitng a Pentecostal congregation.